The MSX2 version is one of three developed by Bullet Proof Software for the Japanese market (the other two BPS releases are for the PC-88 and Sharp X1 platforms). 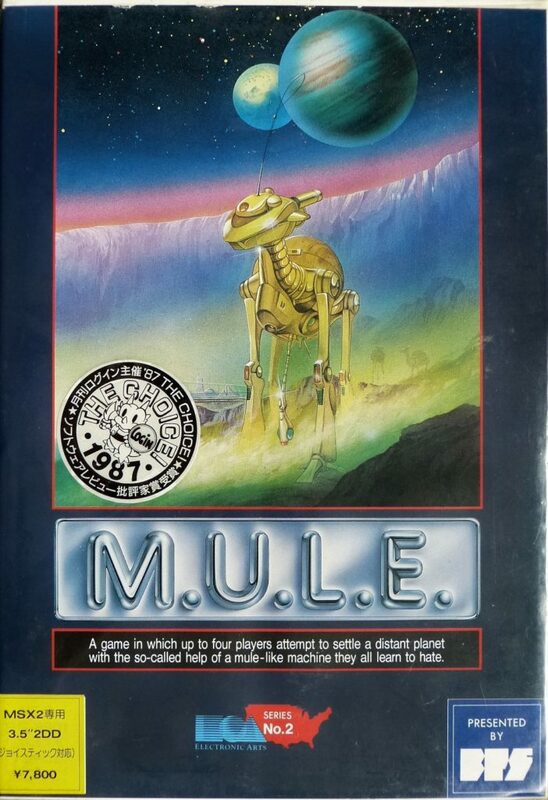 It was a rather late release of classic M.U.L.E., in 1988, five years after the release of the original versions for Atari 800 and Commodore 64. Let’s see if these five years of time have resulted in a better game compared with the original Atari/Commodore versions… See below in the Gameplay section for details! One thing is for sure: One distinguishing element of MSX2 M.U.L.E. is the beauty of it’s redesigned packaging. I have to say I love the M.U.L.E. rendition used here even more than the original one. It looks like straight from a 1950’ies science fiction book. Very elegant too! I would love to credit the artist who did this – unfortunately he or she is not credited in the game’s title screen. Maybe someone from the development team knows – if so, please contact WoM. Currently, there are none. I would love to interview any of you for some insights into the development process of this version. If you read this – please contact WoM! First, you need to get and install an emulator for the MSX2 software system. A list of available emulators for many modern platforms (Windows, Mac, Linux) is listed on Wikipedia. Emulator recommendation (state: January 2019) for quick play is to use WebMSX. This MSX emulator works in your internet browser, no need to install software on your machine. Also, for me it was extremely simple to get it working. To play, you simply need to drag’n’drop the MSX M.U.L.E. disk image to the emulator to start playing! Second, you need the MSX M.U.L.E. disk image, located at the bottom of this page in the “Downloads & Gallery” section. Starting the game with WebMSX works like this: After having drag’n’dropped the disk image to the emulator, choose “reset system” from the “power” menu on the bottom left of the emulator. Afterwards, M.U.L.E. auto-boots. After booting up MSX2 M.U.L.E., Atari/Commodore afficionados do feel right at home, but there is a shock: The landmark yellow title screen had to make way for a black scenery, and both M.U.L.E. and characters look… different… A positive surprise is how well the original M.U.L.E. title music has been translated to the MSX2’s PSG chip (a three-channel General Instrument AY-3-8910). Well done, Hiroshi! Luckily, through the aid of Google Translate, it is possible even for Westerners like me to find the right settings for a quick game session. In WebMSX, use the Shift key to select the game mode and the Space key to select the number of players. The following screenshot shows the correct options for a one-player tournament game. After that, we all know that player selection awaits… For this, you need to activate the joystick with Alt-J after having selected the right game mode. The default WebMSX keymapping is Up/Down/Left/Right for the directions, plus Left-Shift or Space for firebutton. Press firebutton to move on to the character select screen. The characters look a bit different than one is used to, but still recognisable. Off we go, Irata has to be colonised! There we have it – the Yellow we missed on the title screen has moved to the planet. We are not colonising a white-colored planet, but a yellow-colored one. Maybe it’s not Irata, but XSM? Who knows. Three nuisances immediately catch the seasoned Atari/Commodore M.U.L.E. players’ attention. First, the status screen is slooow. 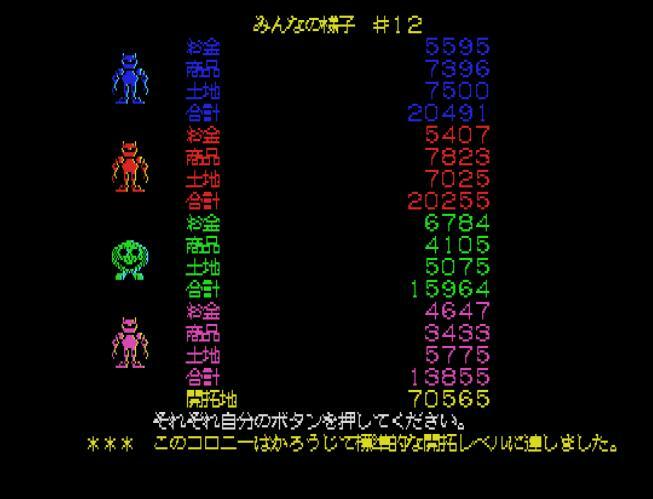 The characters take ages to reach their places so that finally the scores are shown. Second, the land selection cursor moves a lot faster, which makes it more difficult to catch the right plot. Or, I’m getting too old and my reactions have deteriorated. Third, the planet graphics rebuild after each player’s turn. Looks strange somehow. Again, a very positive surprise are the music jingles and the sound effects. All of them are very well translated to the MSX sound chip. When it’s my turn, I start out in the planet town. Here, the nuisance is that the entries to the various town establishments for equipping M.U.L.E.s require almost pixel-perfect navigation of your character. Too often, I fail to enter one them and use valuable time. This is a huge factor for frustration. In general, the controls in the action phase are awkward. Also for equipping M.U.L.E.s onto plots, much more pixel-perfect navigation is required than on Atari/Commodore. I lost a handful of M.U.L.E.s in my first full MSX tournament. 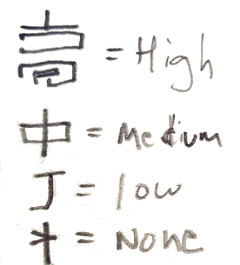 Sure, this can be learned… But it does not add to the fun factor of the game, and can quickly lead to frustration. Good playability feels different. Wampus hunting is extremely difficult in this version of M.U.L.E.. It appears completely at random in the mountains, instead of sometimes appearing a few times on the same mountain. 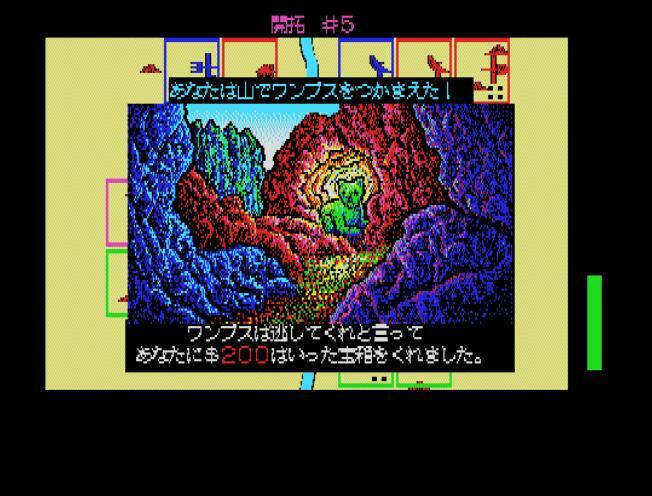 Therefore, the best strategy to catch it on MSX is just to pick a random mountain to stand in front of, and hope that it appears there before the time runs out… And if you finally caught it, you are surprised to see that you seem to have robbed a cute teddy bear rather than a Wampus. Nevertheless, I managed to play smoothly until the end of the tournament. Unfortunately, it did not go well – neither for me, Green Packer, nor for the colony as a whole. Better luck next time!? 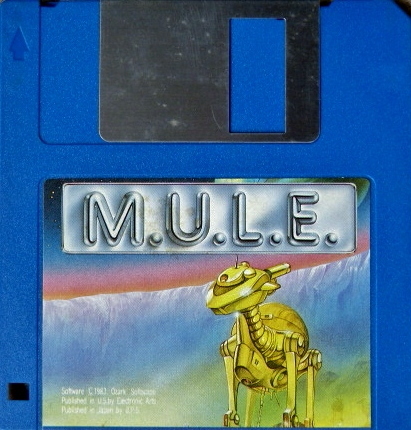 The MSX version of M.U.L.E. does not fare that bad as one could fear from the first look on the title screen. The original game mechanics and economics are still intact. However, a few problems prevent it from achieving the greatness of the original Atari/Commodore versions of the game. It’s some big and some small things that went bad on the MSX. Most prominently, the awkward controls in the town and on the planet during the action phase. Second, the missing visual indication of “who is trading?” in the auctions, which makes them quite confusing. Last, the slooow passing of the status screen. 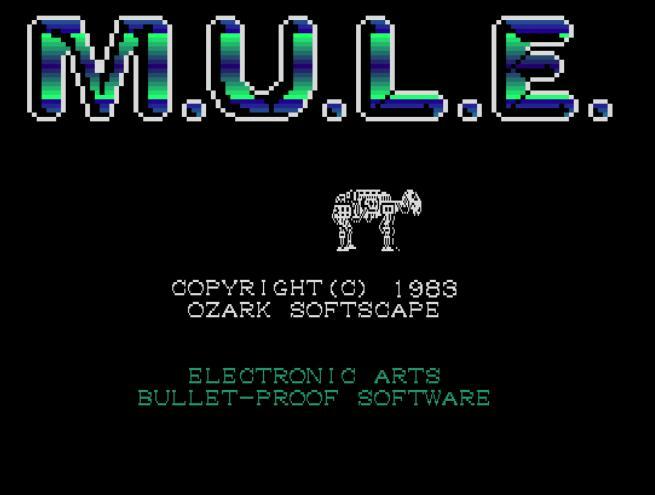 Also, due to the redesign of the graphics, MSX M.U.L.E. has a lot less “flair” than the original versions. Characters and the planet look dull, not bright and comic-like like the originals. For a game which was released five years after the originals, on a much more powerful platform like MSX2, this is a great disappointment. All in all, the MSX one is a version of M.U.L.E. which can be played, be it just for historical reasons. 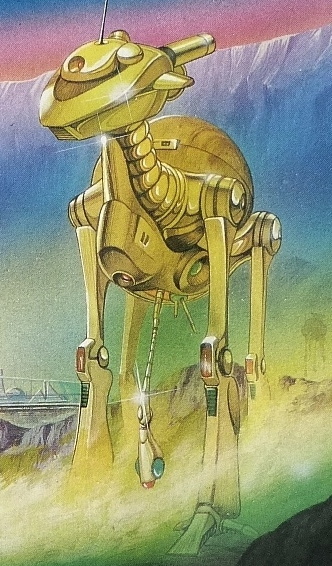 But unfortunately, for me it is perfectly understandable that it did not achieve a big impact in the Japanese gaming market in the year of its release (1988) when it had to compete with games which were superior maybe not from a gameplay mechanics perspective, but certainly from a playability, graphics and audio perspective. The MSX2 would have been capable of so much more. For me, the only plausible explanation why M.U.L.E. ended up in this inferior way on the MSX is an underfunding of the port. It will be interesting to write up the real story behind this port, as soon as contacts with the development team have been established. This section should archive any articles about MSX M.U.L.E. from any other media. As of January 2019, no such articles seem to exist. If you know of any, please contact WoM. It seems the MSX version is based more off the Commodore C64 version than the Atari 400/800 one. An indication for this is that during the planetquake event, mountains do not shift. Nothing more to report so far. 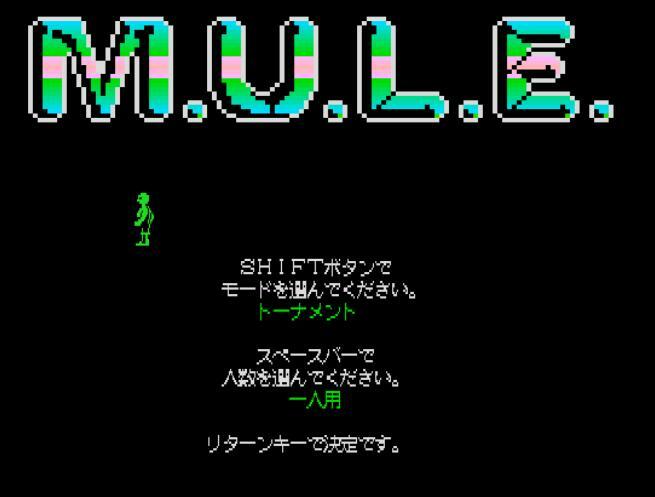 If you have any cool stuff to share about the MSX2 version of M.U.L.E., please contact WoM. 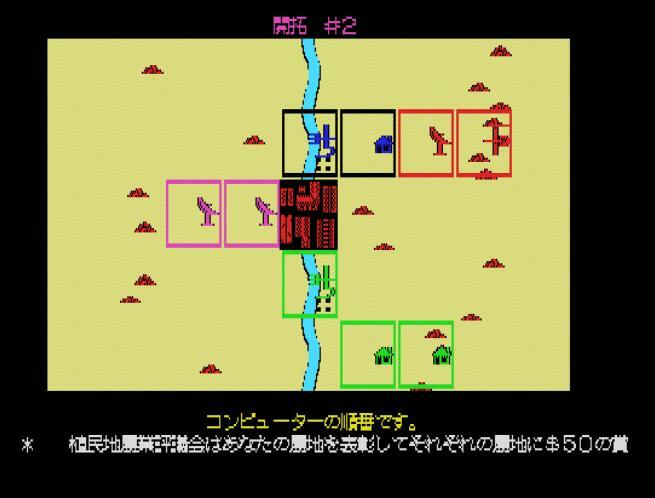 I would be especially grateful for translations of the Japanese texts and comparisons to the Atari/Commodore versions. Is the planet still named Irata, or XSM? Is a Wampus still a Wampus? Do mischievous glac-elves still wreak havoc? 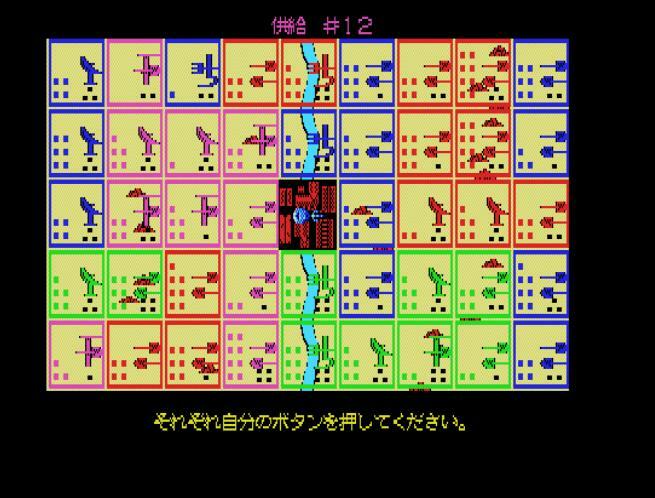 I sourced the scans of the manual in January 2019 from MOCAH and Generation-MSX, not sure which of them created it. The disk image file has a timestamp of August 6th 2001; I honestly don’t remember from whom / from where I got it first. But nowadays, all the known MSX archival sites carry it. 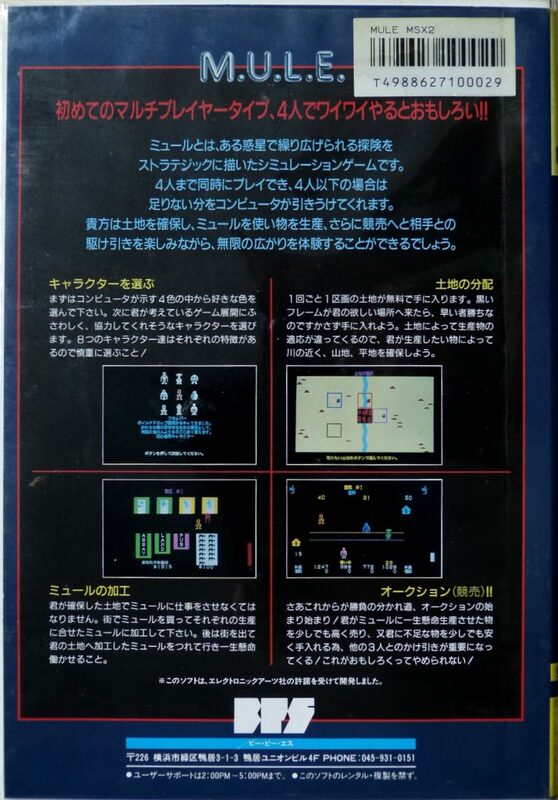 Credits: I sourced the scans of the box and disk in January 2019 from MOCAH and Generation-MSX, not sure which one of them created them. But – kudos for finding this rare gem of a game! Probably commonplace in Japan, but hard to find in the Western world. Credits: Screenshots were created by WoM during a playtesting session with WebMSX emulator in January 2019.